Lapis encourages dignity in friendship and social ability. [Gienger, 54] It encourages the qualities of honesty, compassion and uprightness when dealing with others. [Hall, 173] It provides an awareness of one's motivations and beliefs, and gives a clearer perspective of one's whole life. It reveals not only one's limitations, but the opportunities for growth and to utilize one's gifts and abilities. 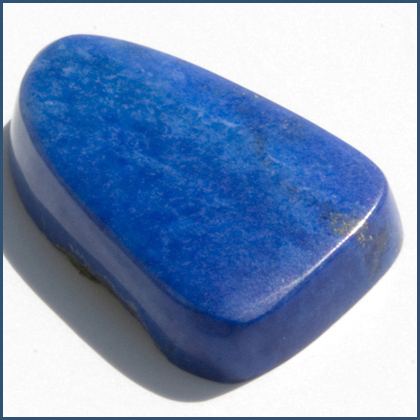 Lapis Lazuli's dark blue energy is perfect for enhancing respect and compassion in ourselves. Dark blue crystals teach us humanity, discretion, and honor. They help us act more charitably, and focus our efforts on service to others. They teach us grace, sensitivity to the needs of others, and tenderness in our dealings. Lapis Lazuli, with its deep blue color, is one of the natural birthstones of those born as the world Lapis Lazuli awaits the vernal equinox and spring (February 19 - March 19). This is a time when new life is about to burst forth, a time of faith and trust. Blue crystals bring you patience and respect.